The female singer-songwriter is back. Admittedly, often with an all-male band in the back, but who are you looking at, anyway? I managed to see two acts at one of the LES’s most venerated musical establishments, despite battling a furious case of the Mondays. On deck? Well, I’d come to see Jane Bruce, a Joni Mitchell-type with a guitar and a single spotlight. I’d met Jane a couple of weeks prior at the Bowery Poetry Club, when she waltzed in and won the first ever “This is Your Song” competition, Bowery Poetry’s singer-songwriter open mic. When the band left the stage, Jane Bruce took to the stool with a humble panache. Joni and Ani would have been proud. Her bell-clear voice wrapped around beautiful stories about love and life in New York, entrancing the audience with her “sad man songs,” as she dubbed them. Miss Bruce had better get into a recording studio fast, is all I’m saying. So a shout-out to all my lady musician friends, for giving me my first non-sausage-fest musical evening in a very, very long time. 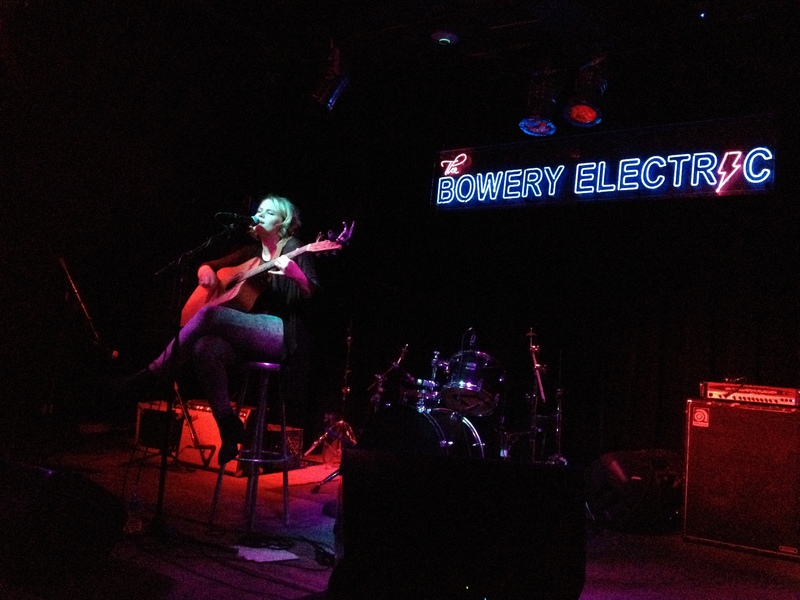 And as for the Bowery Electric, you’ll be seeing me soon. Jane Bruce, in her element.